If you follow me on social media, you know our LA apartment now has a dining table, dining chairs, and a desk in addition to our bed and plants. That's all. We are on a limited budget with Charles in school and me on the job hunt. Although we aren't able to purchase much furniture at this point in time, you can never start planning too early, right? Pinterest has helped keep my ideas and inspiration organized, but for those middle-of-the-night ideas, I should really keep a notebook on my nightstand. Do you do that? I may not be sleeping much (my brain never stops, people! ), but boy am I dreaming of the day when our apartment is furnished and decorated! I can't wait to see it all come together. Patience, Rachel. Patience. I digress. On to the bedroom! A place of refuge, relaxation, and rest. Probably the most important room in the house. 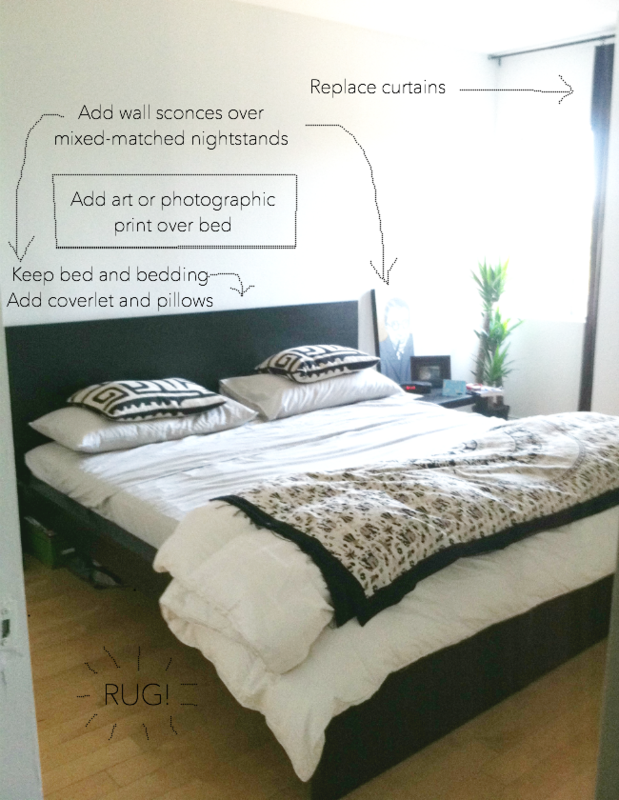 We have a bed, bedding, a desk, wall shelves over the desk, and temporary nightstands (IKEA Lack Side Table anyone?! Only $5 for IKEA FAMILY!). Our minimalist bedroom serves its purpose, and in time, with a couple more additions, it will be glorious! Ahh. Isn't this bedroom so calming and relaxing? My favorite elements are the color combination, the mixed nightstands, the large photo print, and the wall sconces. Charles and I, luckily, have a similar interior style, which helps me when planning our bedroom. Of course, I share my ideas with him. Most often, he likes them. Score! We both have a bohemian, modern, rustic, clean aesthetic - if that even makes sense - and this inspiration bedroom fits our style perfectly! We also both love nature. He has a collection of rocks from India along with some sentimental knick knacks. I have a collection of feathers, skulls, and shells. Collectively (hehe), these accessories will be great for styling our space. The perks of our bedroom are it has amazing light throughout the day and the walls are painted in a bright white, which we love. Even with a king-sized bed, the room feels spacious. With only a few small changes and additions, this perfectly blank slate will be good to go in no time. We purchased the IKEA Malm Bed Frame, light blue/gray sheets, and a down comforter, which are all staying. I'd eventually like to get a sand linen duvet cover (like this one I used to have from Restoration Hardware), but I think we will live with the white comforter for a while. We will add art over the bed, a pair of mixed-matched nightstands (maybe vintage! ), a pair of bronze wall sconces (maybe these or these! ), a curtain or natural shade (or both! ), an area rug, and additional bedding (coverlet and pillows) to add more color and pattern. It may be a couple months before the bedroom is complete, but I'll share afters photos with you then. For now, you can follow my LA Apartment Project inspiration on Pinterest. I've come across some pretty fabulous rooms and products! What do you think about The Inspiration and The Plan? Any other suggestions? !